Poles had already been settling in Dunkirk for half a century by the time they began filling in the neighborhood on the east side of Main-Lamphere Street at the end of the nineteenth century. Nicknamed the “Gorki” district, these Galician Poles traveled to St. Hyacinth’s on Lake Shore Drive, a dangerous trip that required walking over very active railroad lines. As more and more children began making the potentially deadly daily walk to school, families from the hill began talking about starting their own parish. In August of 1902, a committee headed by Michael Czysz, Casimir Stecki, and John Gollon made a formal request to Bishop Colton to establish a second Polish parish in Dunkirk. Seeing the real danger of the trek to church, the bishop approved and St. Hedwig’s was born. To take control of the new parish the bishop sent Father Peter Szulc, who immediately purchased a piece of property that was part of the Heyman Farm. 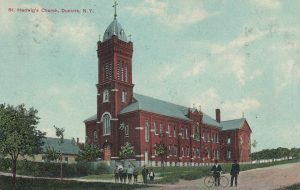 While the first Masses of St. Hedwig’s were being held at St. Hyacinth’s church, a temporary church was built, which Bishop Quigley dedicated on January 9, 1903. With the new parish on a solid footing, Father Szulc was sent to Lackawanna to start St. Barbara’s in April and Father Thomas Stabenau took over St. Hedwig’s. The new priest began raising money to construct a permanent building that could serve as both a church and a school. On July 4, 1904 a delegation of priests from around the diocese descended on Dunkirk as Bishop Colton blessed the cornerstone. The ceremony was highlighted with a sermon given by the Very Reverend John Pitass of Buffalo’s St. Stanislaus parish. By spring of 1905, Peter Meister & Sons had finished the masonry work, Frank L. Kolpien the carpentry, and on May 30 the completed church and school was dedicated. That September, two Felician Sisters arrived and began instruction of the 153 students in the school. The congregation didn’t get to enjoy their new church for long as a fire on December 29, 1905 decimated the building. Without skipping a beat, Father Stabenau began construction on the third St. Hedwig’s. With a budget of $16,950, the construction firm of E. J. Bailey of Brocton had finished a second combination building with the church on the upper floor and the school on the first in time for a dedication of June 9, 1907. With the church in place, Misters Nowak, Graminski, Kozlowski, and Michalak began an effort to establish a parish cemetery in 1908. It would take four years but in 1912 a site on Bennett Road was purchased and in June, Franciszek Boldt became the first interment. With all the construction of the multiple churches, it would take decades for St. Hedwig’s to work off the debt. Despite not being a large parish, St. Hedwig’s supported many religious and civic organizations. As early as 1905, the parish had its own band and soon branches of the Polish Roman Catholic Union, Polish National Alliance, and Polish Union as well. Many of these groups would come together in 1920 and form the Kosciuszko Polish Home Association with a clubhouse on Nevins Street. Seventy years after it was established, St Hedwig’s built a fourth and final church. 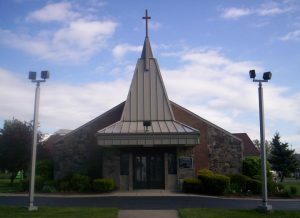 On May 21, 1972, ground was broken for a church that would be completed for an Easter 1973 opening Mass. Around the same time the parish school closed, but not before graduating bestselling author and Polish folklorist Sophie Hodorowicz Knab. In 2008, as part of diocesan restructuring St. Hedwig’s and St. Hyacinth’s parishes were joined creating a new parish, Blessed Mary Angela Truszkowska. The new parish now uses both worship sites. "Arrangements for Dunkirk's Memorial Day." Buffalo Courier [Buffalo, NY] 21 May 1905: 19. Print. "Busy Times Ahead For Dunkirk." Buffalo Courier [Buffalo, NY] 3 Apr. 1904: 19. Print. Chodan, Diane R. "Poland Felt Sting of Hitler." Observer Today. Observer Newspaper, Dunkirk NY, 29 Jan. 2017. Web. 07 Feb. 2017. "Consecrated by Bishop Colton." Buffalo Courier [Buffalo, NY] 31 May 1905: 7. Print. Golden Jubilee, 1952, St. Hedwig's Parish, Dunkirk, New York. Erie, PA: "Skarb Rodziny, " St. John Kanty Prep, 1952. Print. "Honor Memory of Soldier Dead." Buffalo Courier [Buffalo, NY] 28 May 1905: 19. Print. "St. Hedwig." Polish Parishes of WNY - Detail. Polish Genealogy Society of NY, n.d. Web. 17 Jan. 2017. "St. Hedwig's Dedicated." Buffalo Courier [Buffalo, NY] 12 Jan. 1903: 2. Print. "Throughout This Vicinity." Jamestown Evening Journal [Jamestown, NY] 22 May 1906: 6. Print. "To Celebrate Anniversary on St. Patrick's Day." Buffalo Courier [Buffalo, NY] 6 Mar. 1904: 43. Print. "Will Lay Cornerstone of New Church." Buffalo Courier [Buffalo, NY] 3 July 1904: 16. Print.